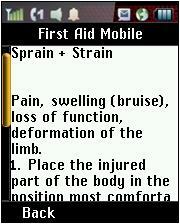 Always be prepared for emergencies with this comprehensive first aid handbook for your phone. It has detained instructions for dealing with over 50 emergency situations including burns, animal bites, heart attack, stroke, poisoning, ice rescue and childbirth. Also includes a list of emergency numbers around the world (911 is US-only). I downloaded this app to my flash drive to later install on my LG840G. It says to open with another recommended program, which I tried, unsuccessfully. Any ideas? The following procedure works on the LG 800G. It may also work on the LG 840G. Copy the jar and jad to the “other” folder on the phones memory card using a data cable or card reader. On the phone tap the Icon menu icon (it has 4 dots on it). Swipe the screen to bring up a second page of icons. Tap “My Stuff”, then tap “Other Files”. then tap the jad file you copied to the phone to install. Super. Great app. Thanks for sharing. I recommended this to a couple of my daughters flighty friends. Good find. You ought add the health tag.